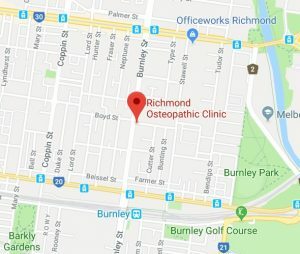 If you’re suffering from neck, back or shoulder pain and are in need of a trusted local Osteo to relieve you from your discomfort, Richmond osteopathy clinic is a short distance from Cremorne and has a range of well trained and certified Osteos available to treat you. Getting to Richmond-Osteopathic Clinic is easy and you have many options from Cremorne. If you wish to drive, Cremorne to Richmond is less than 1.5km in distance. Depending on traffic it’s only about a 5 minute drive door to door. Burnley Station is only a short 6 minutes away, jump on the Lilydale/Belgrave/or Glen Waverly lines. There is plenty of street parking that is free for 2 hours. We’ll make sure to have you in and out before you can be given a ticket. If you arrive at Richmond Osteo Clinic early or feel so great after your treatment that you wish to relax with a coffee, there are plenty of great cafes close to the Swan Street and Burnley Street corner. A popular cafe loved by all our staff and patients is just over 200m called Brother Burnley.